Great news! If you missed our symposium in September last year, you can now watch the recordings. We’ve got plenty for you to choose from – read on. To hear Stroma Cole talk about the recently published book “Gender Equality and Tourism: Beyond Empowerment”, which she edited, and recount some of the personal stories featured within it, watch this clip on YouTube. Dr. Paola Vizcaino from Bournemouth University spoke to the group about her PhD work on women’s empowerment as a result of their work as producers of handicrafts for tourists in Mexico. You can watch her presentation here. The tour operator’s perspective was provided by Natalie Kidd, Managing Director at Peak DMC and a driving force behind the organisation’s focus on socially responsible tourism. To watch her talk about an industry effort to employ more women guides, watch the YouTube clip here. The final presentation of the day came from Nicole Sautter of TravelLife, a certification scheme which helps hotels improve their social, economic and environmental impacts. Watch the recording of her presentation by following this link. The ensuing discussion touched on a range of topics – from the practical challenges of getting women employed as tour guides against the prejudices of their communities, to questions around implementing gender equality metrics in local and regional tourism plans. You can listen to it in full length here. And don’t forget, you can still purchase a copy of the book “Gender Equality and Tourism: Beyond Empowerment” from the CABI Books online bookstore. 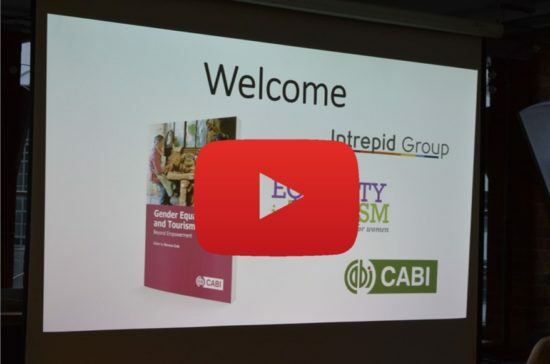 A big thank you to CABI, who provided us with these clips as well as great support in organising this event, and Intrepid, who offered their office space as a venue.